Charles J. Bodnar and Sue E. Kriebel of the city’s Stormwater Engineering Center will discuss the results of the $3 million City funded study being worked by Dewberry consultants. The study shows seven major areas of the City that could have heavy financial impact from future SLR and flooding. Suggested solutions include storm surge walls along the beach from Fort Story to Little Creek with gates at the Lesner Bridge. This along with others projects could cost the upwards of $2 billion. Mr. Bodnar and Ms. Kriebel will also discuss next steps for this study which will include public input and conversations regarding funding and project ranking. Bayfront Beach Replenishment Update – The bid has been awarded to dredge the Lynnhaven Inlet and to use the sand to replenish the Cape Henry Beach. Updates on the project start and finish dates will be provided as they are shared. Community Rating System (CRS) – Official release of Virginia Beach status and initial ranking will be provided in April. Estimates show we should be in the 10% to 20% cost savings to a property’s annual flood insurance premium. 4th of July Fireworks for Cape Henry Beach – Cape Story by the Sea Civic Association officers and the Bayfront Advisory Commission Chairman met with Councilman Jones, Deputy City Manager Cover and City Entertainment contractor IMG to request that the 35 year old annual event become a City managed and operated show. State Fire Marshal regulations, lack of pyrotechnic company support and insufficient funding have become too restrictive for the event to continue to be held at the State Park and coordinated by residents. Windsong Apartments Redevelopment – The 14+ acre site located between Pleasure House Road and North Hampton Blvd. currently contains 272 units and are approximately 40 year old. The developer, Bonaventure, is requesting a rezoning to allow the number of units to increase by 160 to a total of 432. Along with the new units, the developer plans to renovate the old units that it will keep. A presentation of this project by the developer has been scheduled for our April 29th SDCC meeting. Dog Leash Law for Beaches – The City’s Animal Control Department is asking for a change to the City’s Dog Leash Law that will require all dogs to be on a leash when on any City’s public beach. On Bayfront beaches, dogs would need to be leashed at all times during the off-season (Labor Day to Memorial Day) and between 6pm and 10am during the season (Memorial Day to Labor Day). Dogs are prohibited to be on the beach at all from 10am to 6pm during the season. 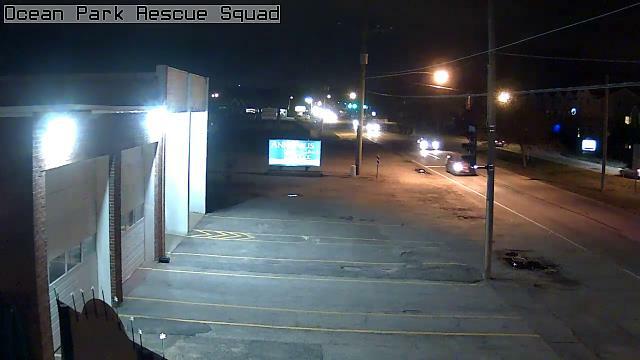 A public hearing will be held on Wed April 10th at 630pm at the City’s Law Enforcement Training Facility. 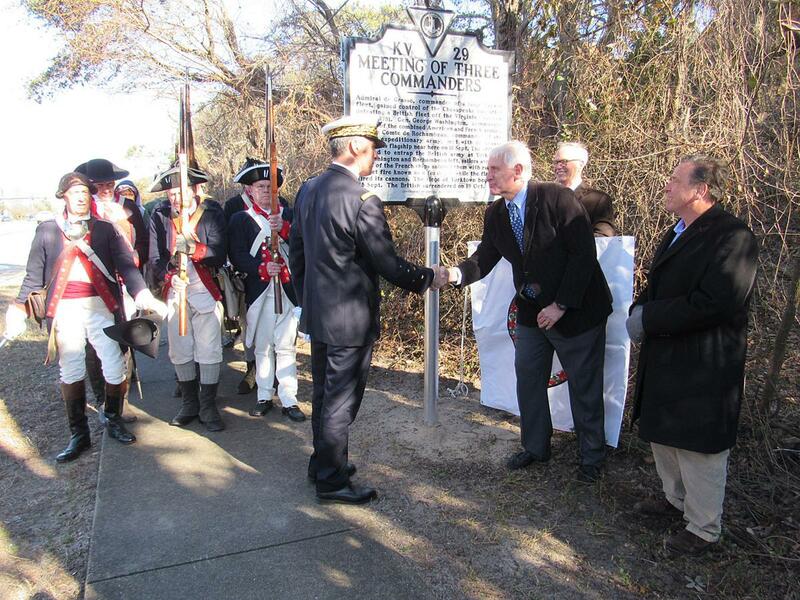 Meeting of Three Commanders – A Virginia Historical Highway Marker commemorating the Sept. 18, 1781 meeting of Washington, Rochambeau and De Gasse was placed in the Lynnhaven Colony Park along Shore Drive and dedicated this past Wed. March 6th. A Virginia Historical Highway Marker commemorating the Sept. 18, 1781 meeting of Washington, Rochambeau and De Gasse was placed in the Lynnhaven Colony Park along Shore Drive and dedicated this past Wed. March 6th. Shore Drive Corridor Improvement Phase 3 (CIP 2-117) – Lesner Bridge to Great Neck Rd. Dewberry Study on Sea Level Rise & ASERT Meetings – Ms. Sue E. Kriebel, PE, Stormwater Engineering Center Department of Public Works, has agreed to attend our March meeting and present an update on the study, details on recommendations for our Bayfront area and next steps that include public engagement. Bayfront Beach Replenishment Update – Has the contract for the Cape Henry Beach replenishment been awarded and what is the start time. Community Rating System (CRS) – Update on when we will know our rating and when it will take effect. Shore Drive 35 MPH Speed Limit 10th Anniversary – Update on request for fatality numbers over the past 10 years. Discuss on planning an anniversary event for Summer 2019. The speed limit was reduced as part of a trial study period in 2009 then followed by permanent implementation. Development Updates – Delta by Marriott at old Resort Hotel location and new apartment development at old Marina Shores Marina site. VB City Council Needs Your Input – Take A Planning Survey To Help – Deadline Friday Feb 8th!!! Unfortunately we weren’t given a lot of notice on this one and the survey has been broken for the past 2 days, but you still have some time to take it. It should only take 5-10 minutes and gives us Bayfront residents a chance to rank how you feel about sea level rise and storm water/storm surge flooding issues. The Virginia Beach City Council is seeking residents’ input on what they believe should be the City’s goals and priorities. The feedback will help the Council plan for and allocate resources. A highlight of the BAC high priority project items has been copied below. 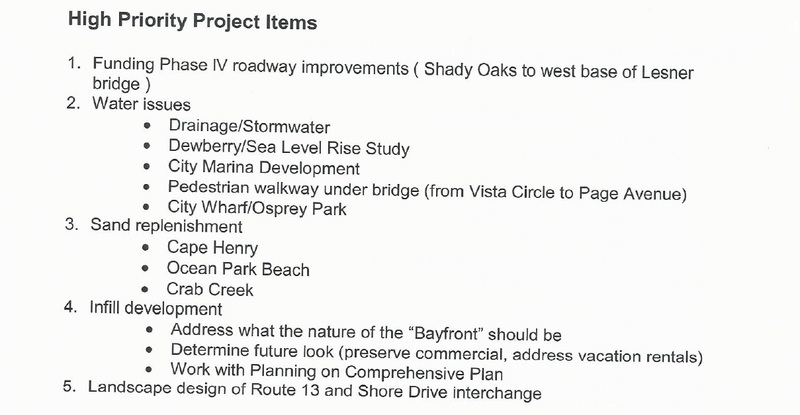 On January 15th, Dewberry consultants presented a draft strategies plan to City Council identifying various projects to help prepare Virginia Beach for a Sea Level Rise (SLR) of 3 feet. The draft plan was created with input from City Staff, a SLR Working Group and consultants. 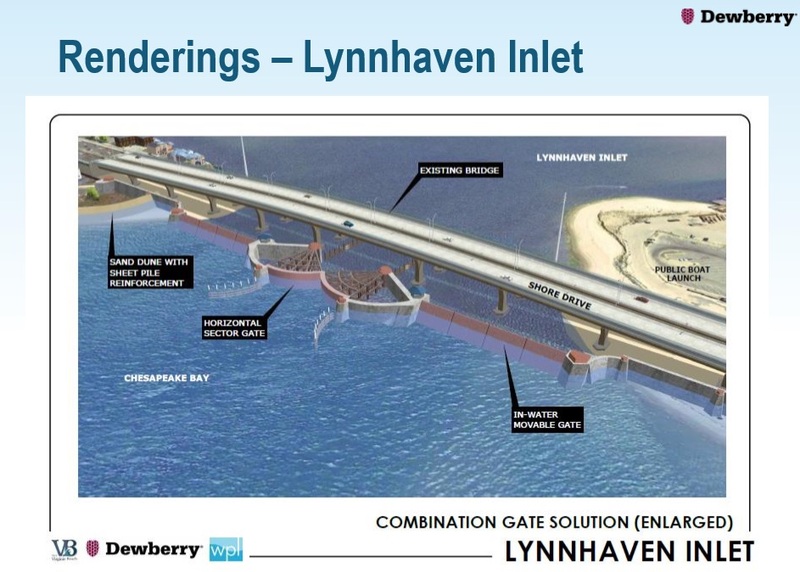 One of the key recommendations in the plan is to build flood walls all along the Bayfront Beaches and flood gates at the Lynnhaven Inlet. 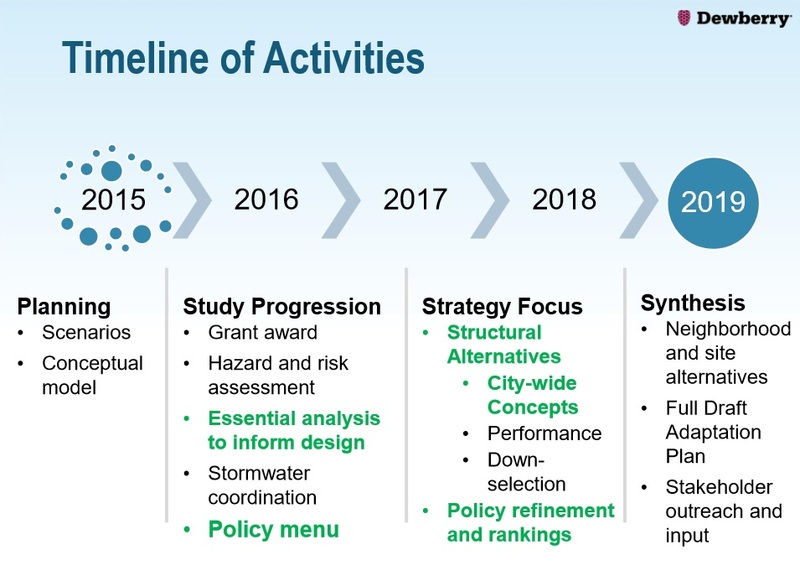 The following timeline identifies stakeholder outreach and input sometime in 2019. It is SDCC’s hope that a meaningful community dialogue can be held that will allow residents a chance to discuss implementation priorities and potential funding methods for the large price tag of $3.0 Billion.